You might be put off by the cost of telescopes, or the amount of research you have to do to navigate the sky. But astronomy for beginners doesn’t have to be expensive or difficult. We'll show you how to get started, and share some apps and gadgets that might be useful. To really enjoy observing, you’ll want to find an ideal point. The best spot for observing will not only give you a clear view of the sky, but also contain little light pollution. That condition, though, can be difficult to meet if you live in a city. If you have a large backyard, standing at the very rear might be enough; you can also try going to a large city park. If you live in an apartment building, try observing from the rooftop, if you have permission to access it. Of course, you may find that staying in the city just isn’t feasible—the sky might not be dark enough, which can make it tough to spot stars, even on a clear night. Hop in the car, get out of the city, and chose a nice spot in the country. Make sure trees do not obscure your view, and don’t trespass on private property. Once you’re out there, what should you be looking at? First off, look up and give your eyes a few minutes to readjust. Without all the light distractions, your eyes will adapt to the darkness, and you'll start to notice a whole host of stars, not just the brightest few. Once you’ve had time to adjust, what you’ll spot in the sky will depend on your position on Earth and the time of the year. But if you're in the Northern Hemisphere, finding Polaris, the North Star, is a good place to start. To find Polaris, try locating the Big Dipper. This saucepan-shaped constellation is a bright section of Ursa Major, and is easily recognizable. Two of the Big Dipper’s stars line up directly with Polaris, giving you a great reference point all year round. Don’t rush out to buy a telescope just yet. You can see and enjoy a whole host of things without digging deep into your wallet. The planets Saturn and Jupiter are relatively easy to spot without needing a telescope; if you’re lucky, you might be able to see Mercury with the naked eye, but it's a little tricky to see because of its position in the sky. You might also able to spot deep-sky objects like the Orion nebula—both the standout constellation and the “local” nebula, which looks like a strange smudge in the sky. If you give your eyes a bit of time to adjust, you might spot the Pleiades, better known as the Seven Sisters, and the Beehive, two interesting star clusters. Asteroids, meteor showers, and comets are also visible without the need of telescopes and binoculars. All of these can be spotted throughout the year, but highlights include the Leonids and the Geminids meteor showers. Binoculars (which are really a pair of mini-telescopes) are surprisingly useful if you're an amateur astronomer, and since they're compact, you can use them to observe the sky from just about anywhere. For a good starter pair, pay close attention to the aperture—that is, the amount of light that the lenses can gather—and its magnification. Try to get a pair that has a magnification of no less than 7, and an aperture of about 50mm; specs of 7 by 50 or 10 by 50 are two great choices for beginners. They will be clearly marked on the side of the binoculars. You can go for something bigger, but the instrument will be hard to keep steady without a tripod. Try to avoid binoculars with a zoom dial, as these can distort what you see. Plus, you’ll find it harder to hold a pair steady without using a tripod. Finally, look at the color of the optics—good binoculars are usually tinted to improve image brightness and reduce reflections. What can you expect to see with binoculars? First off, expect to see the sky become absolutely covered in stars—binoculars can help you spot the stars your eyes can't see by themselves. The real fun begins when you see your naked-eye observations close up. The Seven Sisters will look stunning, and you’ll be able to see the Orion nebula glow with green and blue hues. Binoculars also allow you to study the Moon’s craters. For the most part, Jupiter and Saturn will still look like bright stars, but you might be able to catch a glimpse of their moons, or Saturn’s rings. Additionally, you’ll see a brighter image of planets such as Mars. 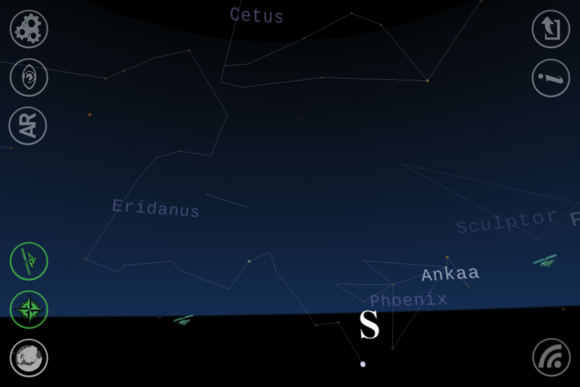 The Night Sky app can show you where celestial objects are, relative to your location. As it turns out, your smartphone or tablet can be your best friend when you go observing. The Night Sky (free; Android and iOS) uses your phone’s camera to show you what’s happening right above you, right now. It doesn't just show you constellations and stars, either; it also helps you spot planets, satellites, and some nebulas. The app is straightforward and easy to use: just point it in any direction, and you’ll get an augmented reality map that shows you where stars and other celestial objects are in the sky relative to your location. Zooming into an area can give you even more details on distant objects. Its “night visibility” mode tints the screen red so it doesn't mess up your night vision. Astro Panel (free; Android; shown above) is useful for checking when the next perfect observing night is coming up—and will even show you how long you’ve got before it gets too cloudy. If you live somewhere not famed for clear nights, this could help you really make the most of a less-than-ideal situation. Ever wondered where the International Space Station is at any moment, or when it might next appear in the sky? Look no further than the ISS Tracker. This website provides the space station's current location, along with its rate of speed and from where on Earth the ISS can be seen. 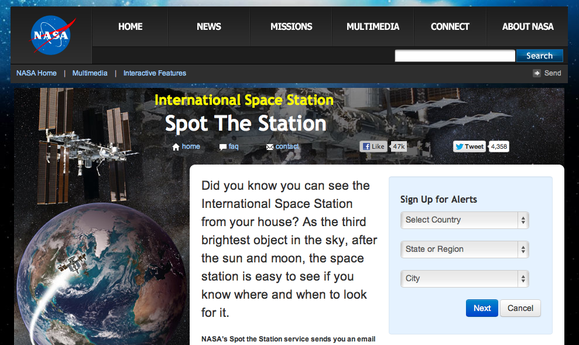 NASA's own Spot the Station (above) will also help you track the ISS, and it lets you sign up for alerts that will notify you when the ISS is flying over your area. Another great website to lose time to is Asterank, which has detailed information on over 600,000 asteroids. The site provides information on each asteroid's mass and composition, and works out the theoretical cost and benefit of mining each asteroid. While you may or may not be interested in asteroid mining, the site is great for data geeks, and it's fun to watch the asteroids orbit. Various photos of the Moon taken at twilight. In general, if you want to take photos of what you observe, you're probably best off with a camera like a DSLR where you can adjust the shutter speed, use a telephoto lens, and so on. For example, you can get some impressive photos of the Moon if you turn up the shutter speed on your camera (1/500 to 1/1000 works) and use a telephoto lens. Long-exposure shots of stars can produce amazing images. Use a tripod for best results. If you have a smartphone and a telescope, you can mount your phone to the telescope's lens and take photos that way. Numerous mounts exist, and you can make your own relatively cheaply. In either case, experiment with your gear, and see what works best for you. Before you rush out, be sure you have a few items on hand, aside from your binoculars, such as a flashlight and a compass. If you can get one, a planisphere—a circular star chart that can be altered by date and time—can help you know what you’re looking it. Fortunately for the tech-minded stargazer, plenty of apps do a good job of replacing paper star charts. Your local astronomy club can be a great place to learn more about stargazing, and to meet other astronomy fans. But don't stop there—your local astronomy club can be a great place to learn more about stargazing, and to meet other astronomy fans. Many of these clubs present lectures led by professors and other figures within the field and hold all sorts of workshops. Better still, you’ll get a chance to try out a variety of different telescopes, which is great if you’re thinking of buying your own. Many clubs operate out of observatories with access to observatory-size telescopes for you to try. Organizers will be happy to show you how to use the telescope, its equipment, and the observatory properly. To find your local club and its website, take a look at NASA’s handy map. This story, "A quick and dirty guide to backyard astronomy" was originally published by TechHive.